Ten years ago, when I was writing about Vision of Escaflowne for a non-specialist magazine, I claimed, “The best way to describe Escaflowne is as the closest thing to a ten-hour Hayao Miyazaki film.” As crude as that description is – and Escaflowne is no mere Miyazaki imitator – it still holds water today. 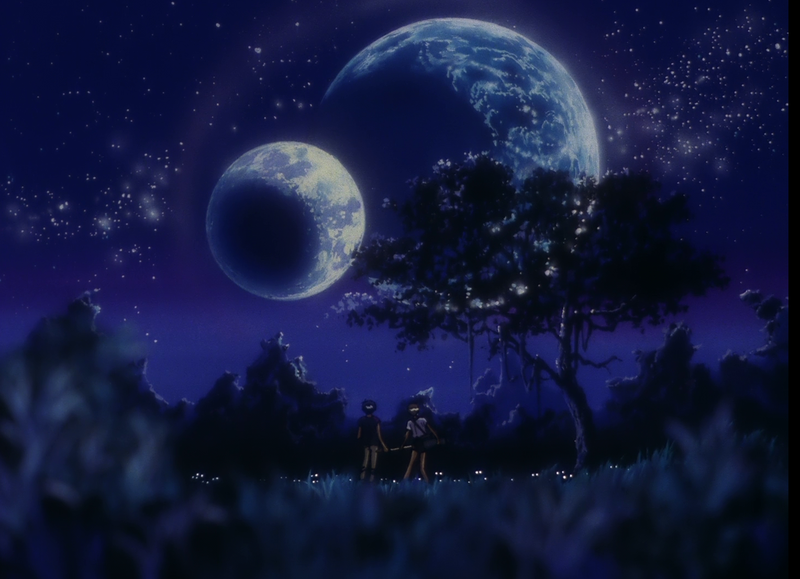 Like Miyazaki’s Spirited Away, Escaflowne is the story of a Japanese girl, a few years older than Chihiro, who’s whisked to another world – Gaea, a fantasy realm where the Earth and Moon hang together in the sky. What keeps you watching, though, are the wonderfully engaging characters. These include Esca’s naïve but brave and passionate heroine, the schoolgirl Hitomi. In the first episode, she’s borne spectacularly from Earth to Gaea on a column of light. In Gaea, Hitomi is caught between two guys – the hot-tempered, dragon-slaying prince Van Fanel, who loses his kingdom moments after his crowning, and the gracefully womanising swordsman Allen Schezar, who happens to be the double of Hitomi’s crush back home. On the enemy side, there’s the bug-eyed demented soldier Dilandu, who’s one of anime’s most enjoyable maniacs. But don’t be fooled. Several of the characters go through outrageous twists and transformations, so beautifully timed and executed that the viewer is carried along gasping in their wake. There’s no snarky knowingness, of the kind you’d find in Shrek or in recent anime about otaku gamers appearing in otherworlds, measuring them by the algorithmic rules of RPGs. Indeed, there are no games references at all. Rather, this is a completely earnest fantasy, whose teen passions and scene-chewing villains could be ludicrous on paper, but which work superbly within the heightened emotionalism of anime, with few of its cheesy excesses. There’s next to no super-deformity, for instance, though Hitomi’s eyes can get very big. 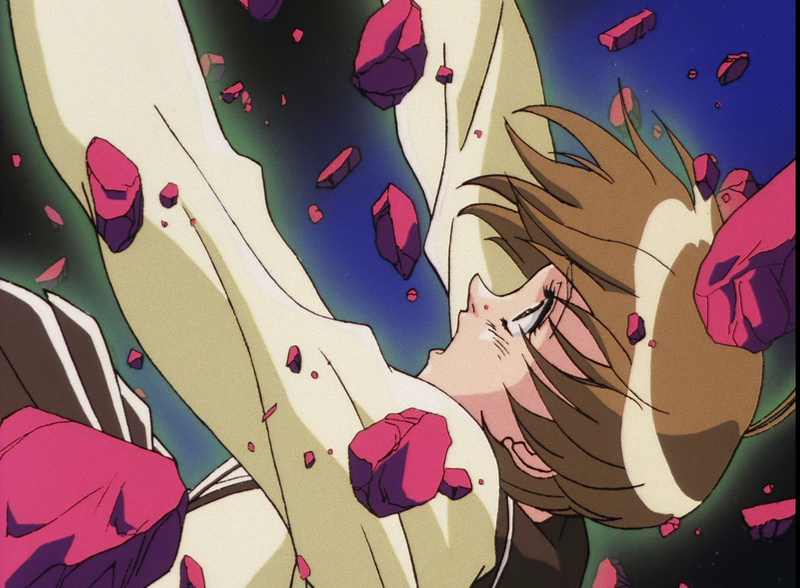 Escaflowne deftly weaves together aspects of both girls’ and boys’ anime, to the delight of all. The mechanised “Melef” power suits, designed with bulging muscles and flowing capes by the anime veteran Kimitoshi Yamane, should keep robot fans happy, while there are elegant heroes and a sultry pair of cat-girls for everyone else. But it’s a sign of Escaflowne’s class that even a potentially stock comedy character like the cat-girl Merle (Hitomi’s instant love rival) can become so much more. Her scenes with Hitomi are gems and when she makes a heart-breaking sacrifice late in the story, you realise how much you’ve come to care for her. 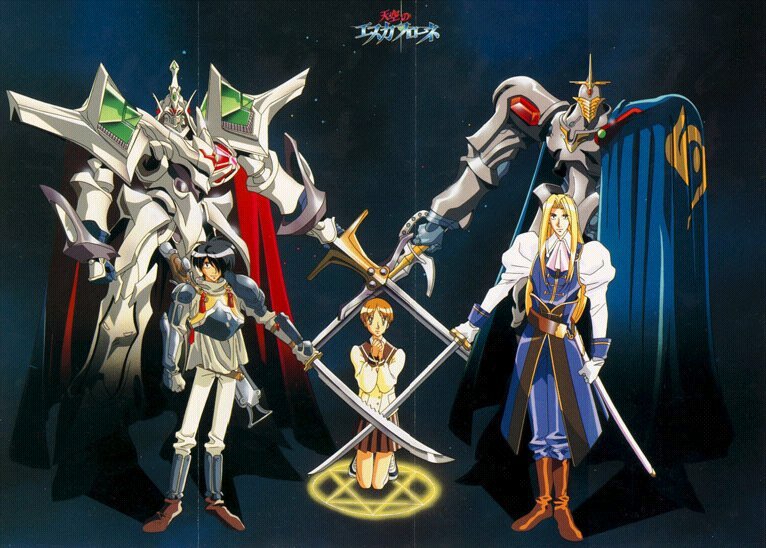 The show’s cross-genre elements should fascinate any anime fan – for example, Escaflowne’s blend of girls’ and boys’ anime styles makes it a strong precedent for Code Geass ten years later. At the same time, Escaflowne was an effective gateway title in its day, watchable by newcomers to anime. 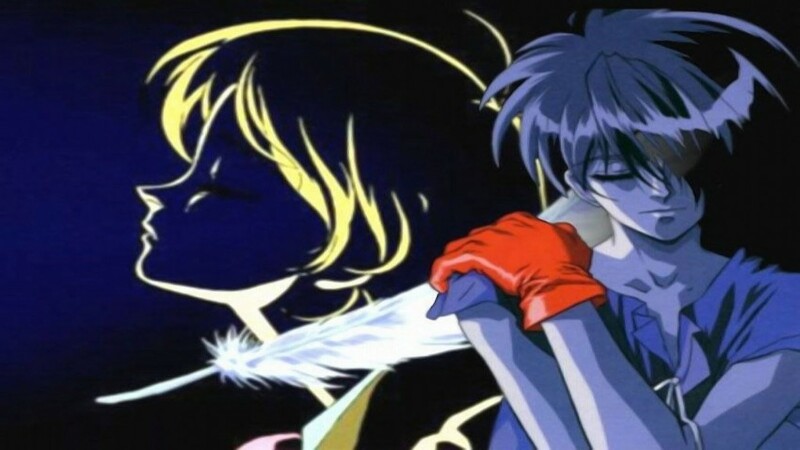 While it wasn’t a great success in Japan, Escaflowne became one of the landmark anime exports of the mid-1990s, like Evangelion and Ghost in the Shell. It was a video success in America (compensating for a disastrous modified version shown on Fox Kids, mentioned here), and a broadcast hit in South Korea. While Kawamori is credited as Escaflowne’s chief writer and story supervisor, he wasn’t its director. At first Escaflowne was developed by Yasuhiro Imagawa (Giant Robo), who envisaged it as more a male-orientated series. This version may have influenced the first Escaflowne manga, serialised in Shonen Ace before the TV series was broadcast; it’s a fight-oriented strip with Hitomi as a transforming magic girl. However, Imagawa moved on from Escaflowne. A hiatus of nearly two years followed, before another director came on board. This was Kazuki Akane, whose early credits had included “Production Advancement” on Zeta Gundam and “Production Runner” on Char’s Counterattack. Akane’s Escaflowne drew much more on girl’s manga, resulting in the hybrid we have today. Akane consulted with the famed character designer Nobuteru Yuki, who had a track record in anime fantasy. He’d been character designer on the 1990 video series, Record of Lodoss War. 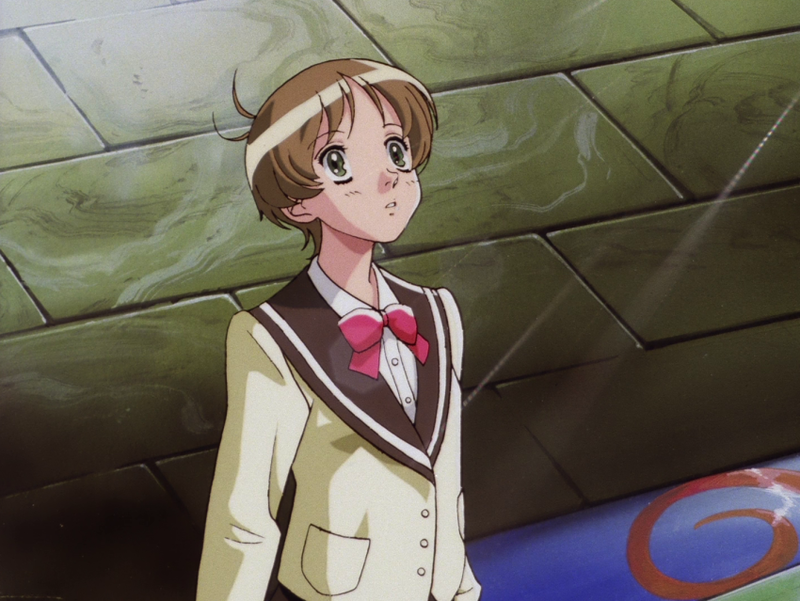 For Escaflowne, Yuki created elegant, elongated characters in line with the shojo aesthetic. For example, Allen had been conceived by Kawamori as a “buff,” hunky character, but Yuki made him long-haired and willowy. The designer also gave the characters their markedly pointy noses, which became somewhat infamous in fandom. Yuki’s designs were recently seen in the anime series Orange (with more moderate noses but a very wide-eyed heroine). Akane went on from Escaflowne to create the 2005 series Noein, already available from Anime Limited. Noein and Escaflowne have similarities, including a vulnerable but strong lead girl, a reality-crossing story, and a memorable lunatic – the time-travelling warrior Atori, who might be the brother to Escaflowne’s Dilandu. Kanno created Escaflowne’s score with her then-husband Hajime Mizoguchi, with whom she’d worked on Macross Plus and Please Save My Earth. Mizoguchi’s own Esca tracks include the scintillating “Hitomi’s Theme” (heard when the girl consults her tarot cards in part one); the cello-based “Shadow of Doubt”; and the glorious “Gloria.” Mizoguchi and Kanno later collaborated on the film Jin-Roh, before divorcing in 2007. Escaflowne’s score brought many fans to Kanno and Mizoguchi’s work (though Kanno’s fame in anime fandom would eclipse her husband’s). The series also introduced a new singing talent. Maaya Sakamoto had acted in a minor anime video, 1992’s Little Twins, but Escaflowne was the breakout for the sixteen year-old. Not only did she sing Esca’s title theme (“Yakusoku wa Iranai” or “Promises not Needed,” by Kanno), but Sakamoto also voiced the lead character, the plucky Hitomi. Soon before Escaflowne’s broadcast, Sakamoto was heard in Mamoru Oshii’s Ghost in the Shell, voicing the ‘child’ Kusanagi at the end of the film. Since then she’s been prominent in anime, in roles ranging from the boy Ciel in Black Butler to Mari Illustrious Makinami in the twenty-first century Evangelion. The latter role is somewhat ironic. Escaflowne started in Japan a week after Evangelion ended; the Anime Encyclopedia describes it as filling Eva’s “morbid vacuum,” as Mari would do a decade later! Sakamoto also sang the opening themes on Arjuna and RahXephon, both by Kanno. Recently, she brought her career full circle by voicing a young Kusanagi in Ghost in the Shell: Arise, including last year’s “new” movie. Other Japanese voice-actors to catch in Escaflowne include Tomokazu Seki as Van Fanel; he’d played Touji in Evangelion and went on to voice Kogami in Psycho-Pass. Dilandu is voiced by actress Minami Takayama, who’d played Kiki and Ursula in Kiki’s Delivery Service and later became the pint-sized Detective Conan in the never-ending franchise of that name (aka Case Closed). But the real support voice to listen out for is Ikue Ohtani, who voices the feline Merle. Two years after Escaflowne, she featured in the first TV Pokemon, voicing a stripy rodent… and two decades later, she’s still playing Pikachu. She also voices another furry anime star, Chopper in One Piece. The Anime Limited release of Escaflowne will contain the Japanese voice track but also the newly-minted English dub of the series. Produced by Funimation, this reunites several veterans of the dubbed Fullmetal Alchemist. Caitlin Glass, who was Winry in Alchemist, plays Hitomi; Aaron Dismuke, Alchemist’s Al, is Van Fanel; Sonny Strait, Maes Hughes in Alchemist, voices Allen; and Colleen Clinkenbeard, who was Riza in Alchemist, plays Princess Millerna, another love rival for Hitomi. If there’s any justice, the new Escaflowne will bring fresh audiences to this outstanding anime. Escaflowne is released on UK Blu-ray by Anime Ltd.
*Clues: he’s historical, and English. I know I ‘m late in replying, but I simply wanted to say it’s really cool you dedicated a blog entry to this fantastic show. It is my second favourite anime series after Evangelion, and I only discovered it fairly late, in 2014. Here in Holland it never aired on T.V. to the best of my knowledge. I think your analysis of the show hits the nail on the head; the integration of shounen and shoujo elements is seamless, and the romance subplot is very subtle and nuanced. The animation is truly breathtaking at points, and it’s greatly enriched by Kanno Yoko’s musical score. I go around recommending it to anyone who hasn’t seen it. It’s a wonderful animated fairy tale. Thank you so much for your lovely comment, and I’m glad you liked the article!